With my new 5D Mark II in hand I decided to head out to Spoon Bay to put it to the test. Boy it is a pleasure to use compared to the 1ds Mark II. The 3 inch screen is amazing. For what I thought was going to be a plain sunrise really lent itself to something special. 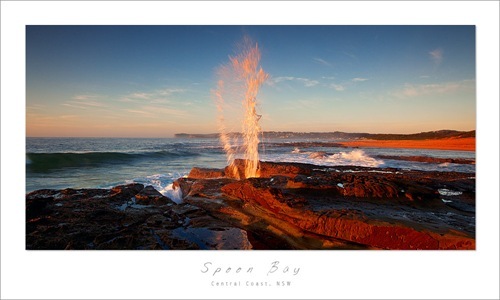 One of the key features of Spoon Bay is the water spout that starts as the tide comes in and on sunrise is really comes to life. Waiting for the right moment and then Bang the sets roll in and the spout goes off. I haven’t really noticed much image quality difference between the 5D Mk II and the 1ds Mk II RAW files in terms of better detail but when processing the shot the blues are so much better and there is also an extra 10MB of files size (at 8 bit) as well which is nice to have. This entry was posted in Uncategorized and tagged 5d mark II review, central coast, matt lauder, Spoon Bay. Bookmark the permalink. Cool shot and yes, that screen is a beauty. Sometimes I find myself turning on live view and just stare at that screen, much better than reality hehe. That’s quite neat considering there doesn’t seem to much of a swell. I haven’t really given my mk2 a good run yet. I used it at 2 weddings in the last couple of weeks and it’s not bad. The detail in the shots is pretty good. I’ve had a 40d for a while now so I’m used to the 3in screen and live view but I do like the info on the screen in live view on the mk2. One problem ,if you could call it a problem , is that it fills up the 4gig cards pretty quickly. Might have to get a couple of 16’s. mate that looks like an angel, have you been taking tips from Ked Duncan again!! !